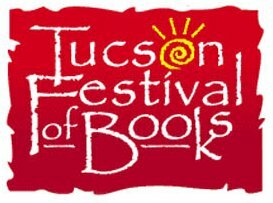 Tucson, the 33rd largest city in the United States hosts the 4th largest book festival in the country. Every year the festival draws more and more people–well over a hundred thousand. That might make you rethink some of the negative stereotypes about Arizona! I volunteered to moderate a session, which I’d never done before. All that entails is introducing the speakers and thanking them at the end–but I was more nervous than if I’d been speaking. The weather was perfect–low to mid 70’s and sunny. Considering what a ridiculously hot winter we’ve had, the nice day was a pleasant surprise. I forgot to wear sunscreen, though. Bad boy! I enjoyed speaking with folks at a couple of booths run by Native Americans. I even scored a couple of free tickets to the Amerind Museum out at Texas Canyon. I hadn’t even known there was an Amerind Museum out there–but now that I know, I’ll make the drive. Anne Perry lives in England, which uses the metric system–but when I translated today’s temperature for her, she said she hasn’t bothered to learn metric. She was brought up using Imperial measures and that what she’s going to stick with. Although I’m ‘bilingual’, I can sympathize with her. Finally, I ran into several acquaintances and/or friends, including Gini Koch, Ben Bova, Nancy Holder, Kristin Lamb, Janni Lee Simner, Larry Hammer, and more. Have any of you ever been to a book festival? If so, what was your favorite part?